It would be difficult to overstate the impact Sam Walton had on American business, specifically retailing. The standalone box stores he pioneered have quite literally changed the nation's landscape. His innovations in supply-chain management and distribution totally reshaped the relationship between suppliers and retailers, and, for the most part, took wholesalers out of the equation. His insistence on low prices altered customers expectations of what they will have to pay for everything from socks to soda. Like few business leaders before or since, Sam Walton changed the world. Saturday, August 14, 1964, was a broiling hot day in Harrison, Arkansas - but the heat was the last thing on Sam Walton's mind. For the 46-year-old Walton, this was a big day: the grand opening of his second Wal-Mart. He was going to make damn sure it was a big success. He'd planned everything. In the parking lot, he'd had two truckloads of watermelons delivered and hired a donkey to provide rides for the kids. He headed outside to greet his first customers. What he saw would make most entrepreneurs lose their cool: The watermelons had burst, and donkey dung littered the lot. Walton's reaction was emblematic of his ability to rise above any challenge. He ignored the mess, smiled, walked up to the crowd, stuck out his hand, and said, "Welcome to Wal-Mart." That focus on customers is Walton's prime leadership lesson. But there are many others, beginning with his obsession with low prices - just the first step in a mission to deliver unbeatable value. 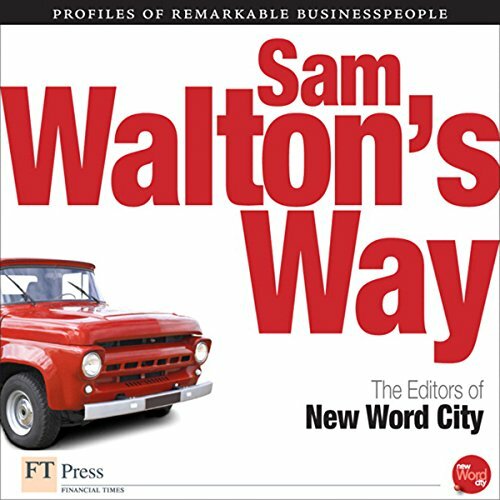 ©2010 New Word City (P)2009 Audible, Inc.
Would you try another book from The Editors of New Word City and/or Suzanne Toren? This was my first audible book and I was looking for Sam Walton's auto biography. I was disappointed in this 30 min junk. It is more like a magazine article. I didn't look at the time length of the book. Just assumed it would be a full length book. My error. Don't waste the $2.